Today at the entrance to Chek Jawa, the guides and visitors were greeted with two adult wild boars and 8 piglets born very recently. The piglets are so small and cute! 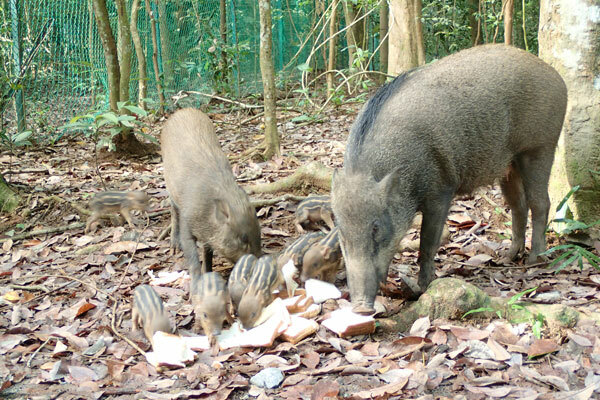 2 adults and 8 piglets feeding on bread. 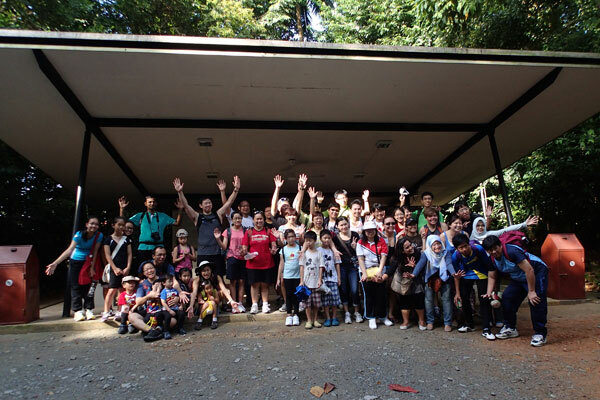 After two months of break for the volunteers from the Naked Hermit Crabs (which felt like super duper long break), the free Chek Jawa guided walk has resumed. 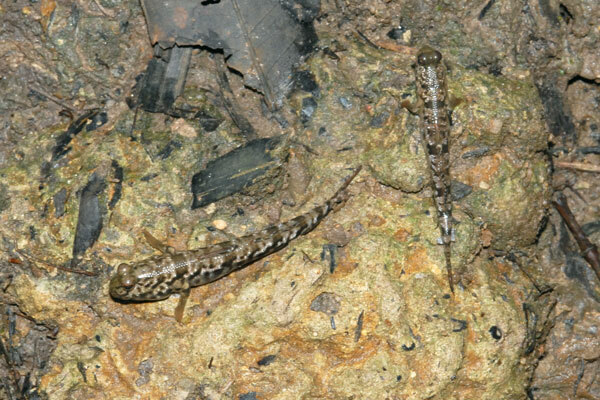 In this first guided walk for the year, the guides and visitors were treated to many interestes critters in Chek Jawa. We have about 50 visitors today, plus 4 of my students who are on an experiential program in becoming a nature guide. Here's the video of the wild boars and the 8 piglets we saw at the entrance. My usual route brings my group through the left trail of the coastal forest into the mangrove. At the entrance to the mangrove boardwalk, I could not locate the star fruit tree. The tree was trimmed and I was unable to find the tree with the flowers. We then walked up the Jejawi tower to get a better overview of Chek Jawa. Back down on the boardwalk, one of the visitors in Ria's group spotted a mud lobster! It was a very rare treat to the visitors who were nearby. For the 3.5 years I have been guiding, this is actually my first time seeing a mud lobster. Two of my students got to see it on their first visit to Chek Jawa. How lucky they are. This was the only pose I got of the mud lobster after patiently waiting with my group for it to appear as it went into hiding with so many people looking at it. There were too many people at the spot when it first appeared and I couldn't take a picture or a video of it. The sighting of the mud lobster made my day and a great way to start the mangrove section. 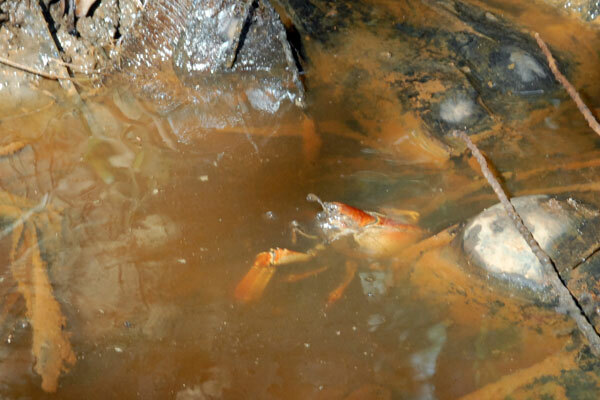 Mud lobsters are very shy creatures that live deep in the mud. They hardly come out of their burrow, even during night time. 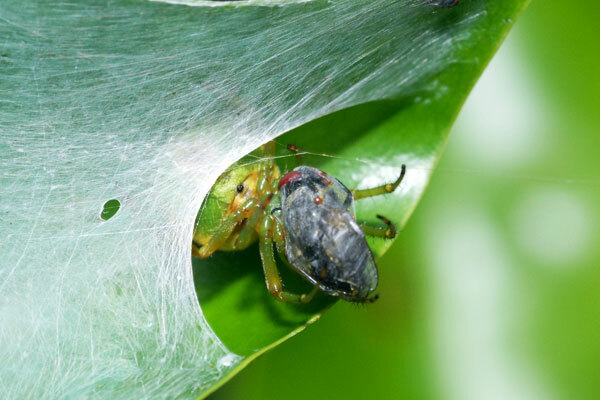 A father in my group pointed out a spider housed on a leaf to his son. It it was clearer to see what it was with my macro lens. My young visitors are really good at spotting small critters. It takes some time for our eyes to get used to the colours in the mangrove environment and soon enough, many little critters start appearing in front of you. 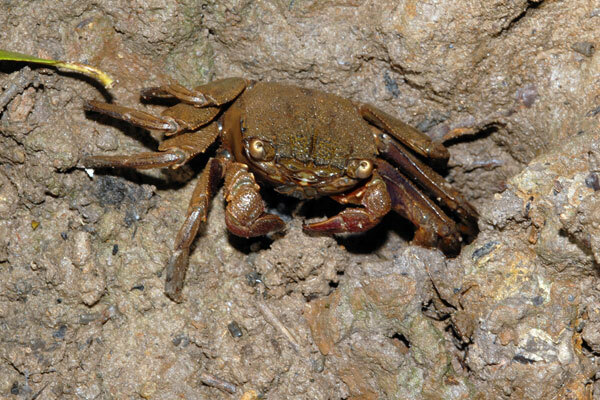 They were able to point out the mudskippers, the tree-climbing crabs and the fiddler crabs in the mangrove. Even the adults are doing an impressive job at spotting. 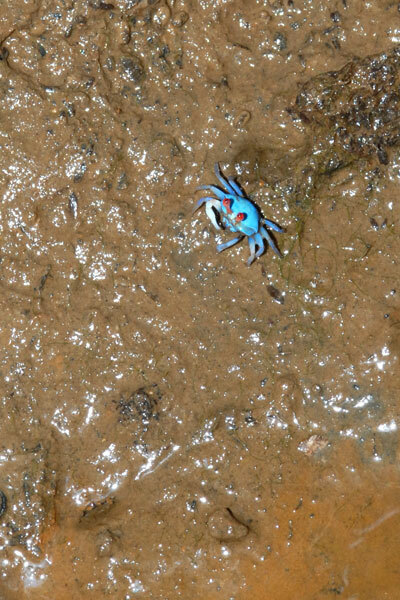 One of them actually spotted a mud crab hiding in a hole under a tree. 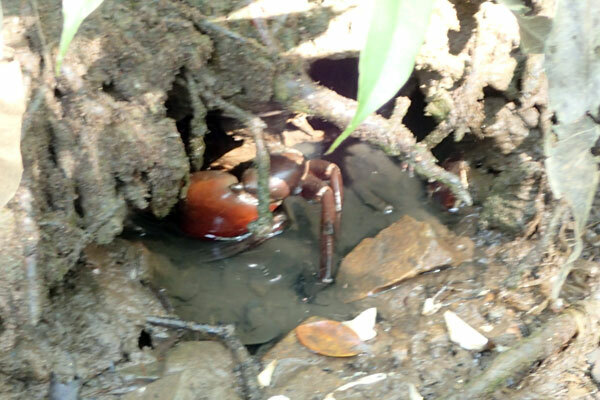 Mud crab in a hole under a tree. Armed with my big camera and macro lens, I was able to show the children and adults in my group how the tiny blue fiddler crab looked like. Along the coastal boardwalk, my visitors were treated to more fiddler crab activities next to the Bakau tree at the boardwalk junction. 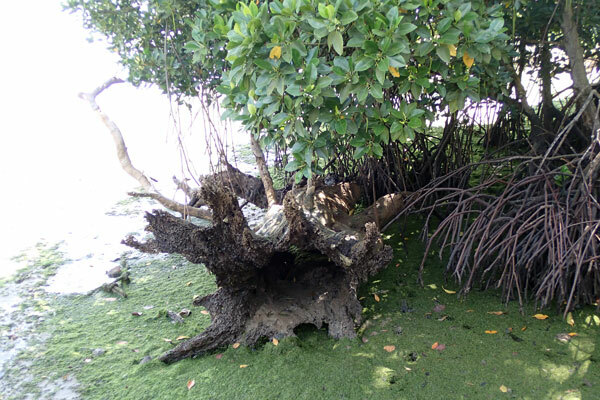 It seems that the dead mangrove tree that used to stand on the intertidal area has decayed badly and is washed up next to the Bakau tree. It used to be a subject where many landscape photographers like to use for landscape shots from Chek Jawa. 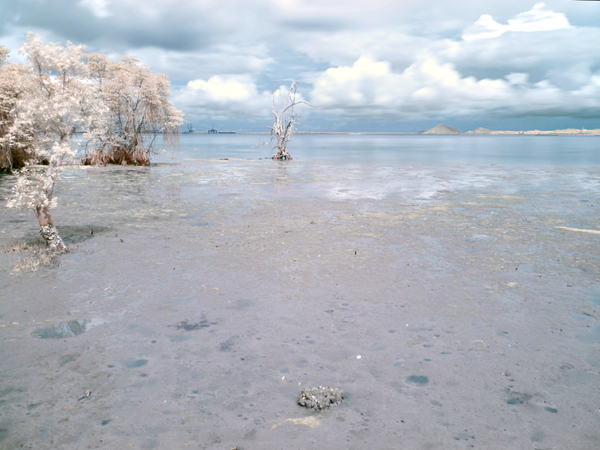 I could only locate one Infra-Red shot with the tree in my online gallery. The dead tree in the middle. 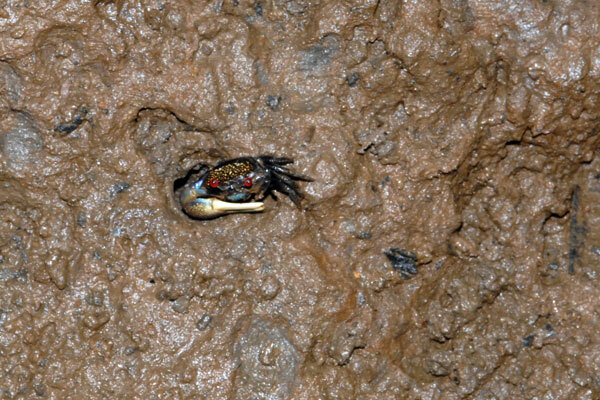 No otters were sighted today but the sighting of the mud lobster was a more than enough replacement for it. Other guides for this trip: Chay Hoon, Jia Ling, Ley Kun and Ria. My students on training: Ca Lin, Isabel, Sarah Ooi and Vindhya.